In a previous post “Your Freshman Dorm,” I talked about posting a list of “essentials” for your college dorm. These are things that are must-haves for your dorm, or things that I’ve found I needed in school! If you want to see how I organized all of these things with a nice spreadsheet, scroll on down to the end! -A FAN!!!!! I was not prepared for it, but it was hot. No A/C. -A refillable, filtered water bottle. Brita makes a great one. In my dorm, our mini-fridge was too small to hold gallons or jugs of water, and getting a lot of water bottles is expensive! This is great to have. -Light bulbs. My freshman dorm didn’t have overhead lighting, and what are you gonna do when your lamp bulb goes out Luckily, we both had lightbulbs! -For doing laundry, I would recommend getting laundry detergent pods. They’re super easy and you just throw them in! -A lap desk. There were so many times I would eat in bed while doing some homework. I used the lap desk as a little table off to the side so that I could have my computer on my lap! -Swiffer. Not a mop, not a broom! A wet broom? It picks stuff up- trust me, it gets DUSTY in there. -Disinfecting surface wipes. Sooo convenient if you’ve got a bathroom to clean. Or even just a desk! Clorox makes them, but you can get just as good store brands! -Paper towels- you wouldn’t initially think of them, but there are spills! -TOILET PAPER: i know this doesn’t sound unexpected. But the unexpected part was the AMOUNT. In my suite, 6 girls shared a bathroom. We went through toilet paper like CRAZY. -Shower flip flops. Bring them. Wear them. -White board. I can’t tell you how organized this kept me. I would write out all the things i needed to get done that day, along with my schedule for the week right next to it. -Printer. I would spring for one- it really was so much more convenient than having to go to a lab or the library. -Paper plates, bowls, napkins, and utensils. I was all “nooo, I want real plates and bowls.” You will not want to wash your dishes. Trust me, disposable is the way to go. –Velcro command strips. Hangs up everything. Blue tack doesn’t do the trick on cement walls. -Along the same vein, mounting tape. It’s like command strips, but without the Velcro! Held up my pictures like magic. -Ice pack/heating pad. Cramps, pains, etc. I had one from CVS that I could microwave and put in the freezer to be both. So those are the unexpecteds or essentials. Let’s get onto the must-haves!! 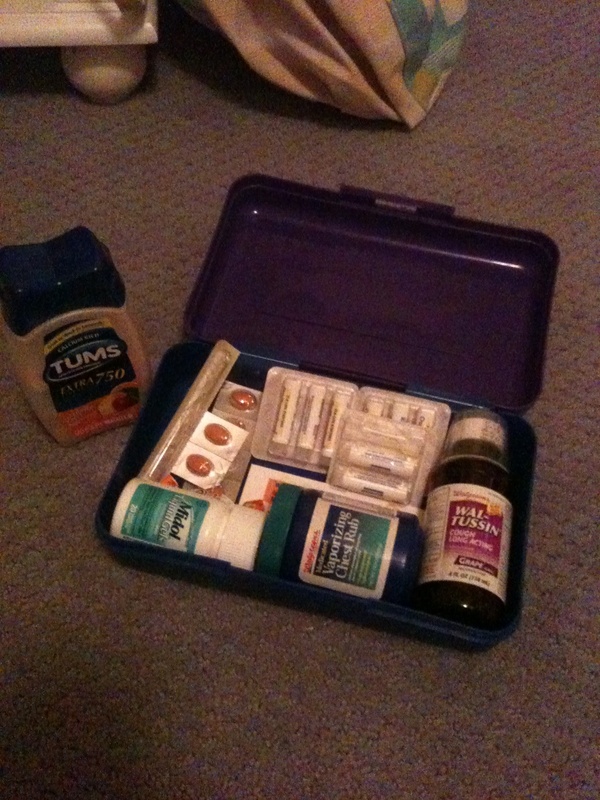 This is a picture of my little medical kit! It’s just an old pencil case. In it, I have Advil Cold & Sinus, the Walgreens version of Vicks VapoRub, cough syrup, Midol, Tums, and those little tubey things are a natural immune support. It’s called Oscillo, or Oscillococcinum, you can buy it (for a lot) at Target. A good alternative to these is AirBorne. Blue is “to purchase”. Gonna be honest, I didn’t end up purchasing a lot of those things. Just think about if you think you’ll use them. Black is “already have, and have many.” Like Q-tips, cotton pads, pens, etc. I hope this list was able to help you! I also hope you have a marvelous day! This entry was posted in College, Dorm, Uncategorized and tagged college, college essentials, college organizer, collegiate, Dorm, dorm diy, dorm essentials, dorm life, dormitory, organizer, res life, school shopping, spreadsheet, university. Bookmark the permalink. Love the post, love the blog, I even have a crush on the theme you’ve used. Thank you for the great list! As a fellow lover of spreadsheets, I can honestly say you have made my day.